Be the first to share your favorite memory, photo or story of Mrs. Peggy Bush. This memorial page is dedicated for family, friends and future generations to celebrate the life of their loved one. Mrs. Peggy Bush Cooper, age 84, of Dallas, Georgia, passed away on Tuesday, January 15, 2019 at Tanner Medical Center- Villa Rica (Villa Rica, Georgia). Mrs. Cooper was born on March 10, 1934 in Vienna, Georgia to Joseph Daniel Bush and Gertrude Peavy. 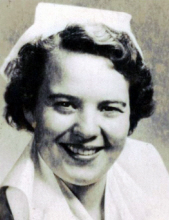 Prior to her passing, she worked as a registered nurse. She was preceded in death by her parents, Joseph Daniel Bush and Gertrude (Peavy) Bush; her brother, George Mack Bush and her sister, Joann Bush Wiese. Peggy is survived by her husband of 63 years, Billy Cooper; her son, Dan Cooper; her son, Glenn (Kimberly) Cooper; her grandchildren, Katherine Cooper and William Glenn Cooper, II; her sister, Joyce Lancaster; nieces and nephews also survive. Funeral Services for Mrs. Cooper will be held on Saturday, January 19, 2019 1:00PM at Benson Funeral Home with Rev. Jimmy Tibbitts officiating. Interment will follow at Dallas Memory Gardens. The family will be receiving friends on Friday, January 18, 2019 from 5:00PM -8:00PM and Saturday, January 19, 2019 from 12:00PM -1:00PM. All visitations will be held at Benson Funeral Home. To send flowers or a remembrance gift to the family of Mrs. Peggy Bush Cooper, please visit our Tribute Store. 444 Confederate Avenue Dallas 30132 Ga.
"Email Address" would like to share the life celebration of Mrs. Peggy Bush Cooper. Click on the "link" to go to share a favorite memory or leave a condolence message for the family.